When you click on the Settings tab, the following screen will be shown. Here all your Personal Details like name, date of birth and email address will be displayed. 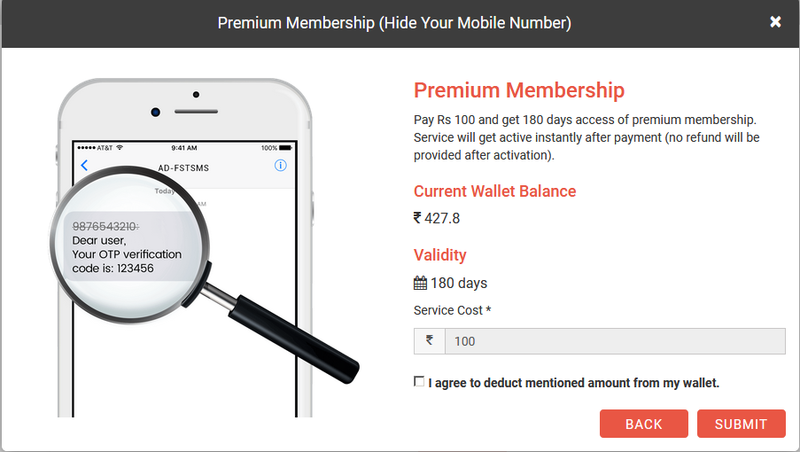 If you wish to hide your mobile number, then click on the button ‘Get Premium membership‘. 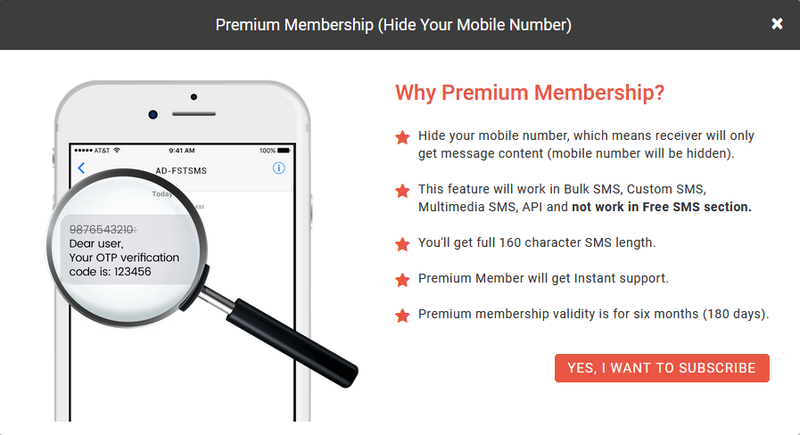 Premium Membership is special feature of Fast2SMS, with the help of this feature users can hide their number. 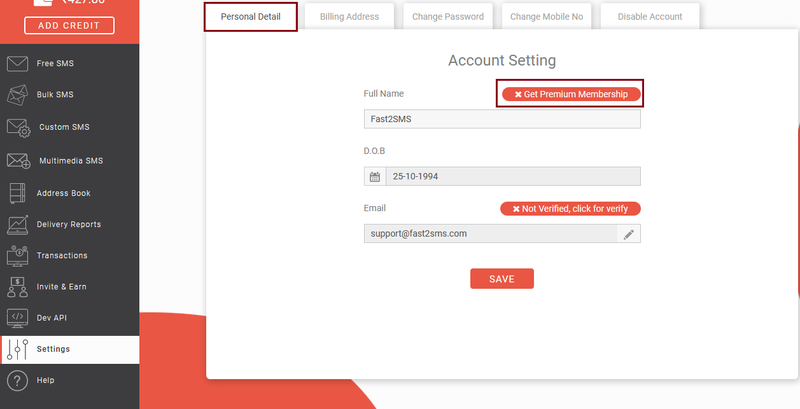 It means if you have premium membership then receiver will not receive your number in SMS. As you press “Get Premium Membership”, a dialog box will open up like the one shown below. Click on Yes, I want to subscribe button. After pressing this button, next dialog box will appear. Click on the check box then select the Submit button. Validity for premium membership is 180 days and Rs. 100 will be deducted from your Fast2SMS wallet. If you want to renew your Premium Membership, click on “Renew” link in account setting. 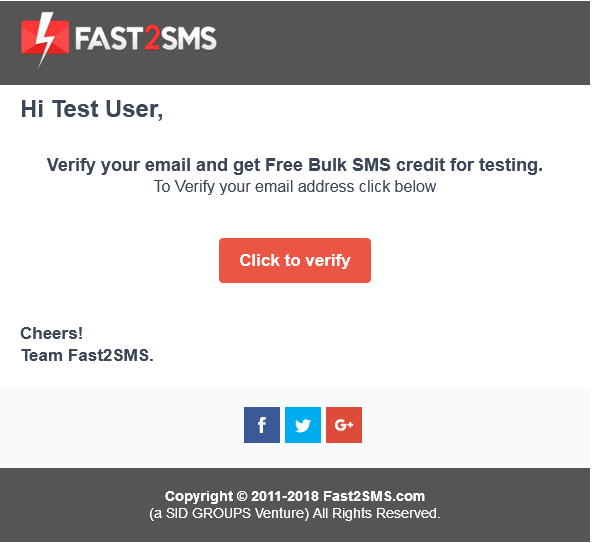 If you verify your email, then you will get 30 FREE SMS for testing. Click on the red button to verify your email address. Once you click on it an activation link will be sent to your registered email address. When you verify the email, you will get 30 SMS. Click on the red button ‘Click to verify’ to verify your email. 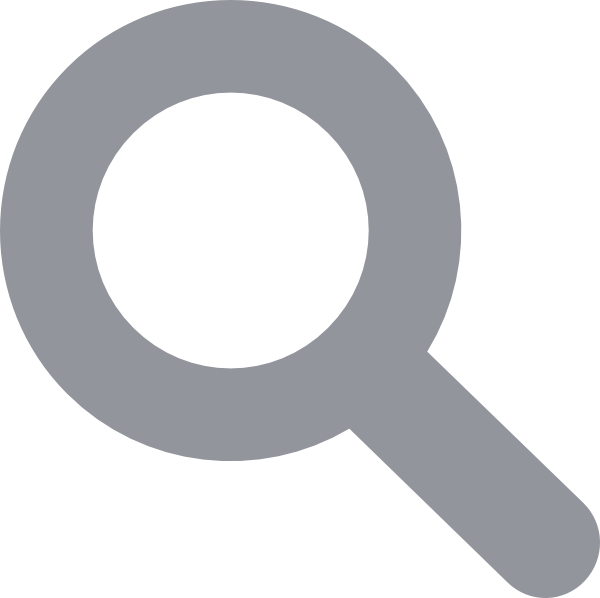 If you want to change your registered email ID, you can do it so by visiting the Personal Detail section. In this section just click on the pencil icon next to the email. When you click on the pencil icon, a window gets open as shown in the image below. Enter your Current Email, then enter New Email and at last type your password. Click on Change button to change the email address. Your email address will get updated. As you click on the Billing Address option, the following screen shows up. GST number is optional, if you want input credit then only enter GST number otherwise leave it blank. Company name is also an optional field. It is not compulsory to add GST No. and Company Name. Below you find other details which are mandatory to fill. 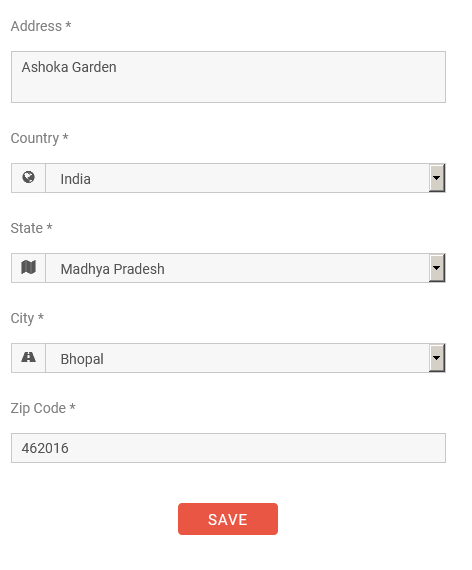 Fill your address details, select country, state, city and enter your zip code. After you have entered all the details press Save. 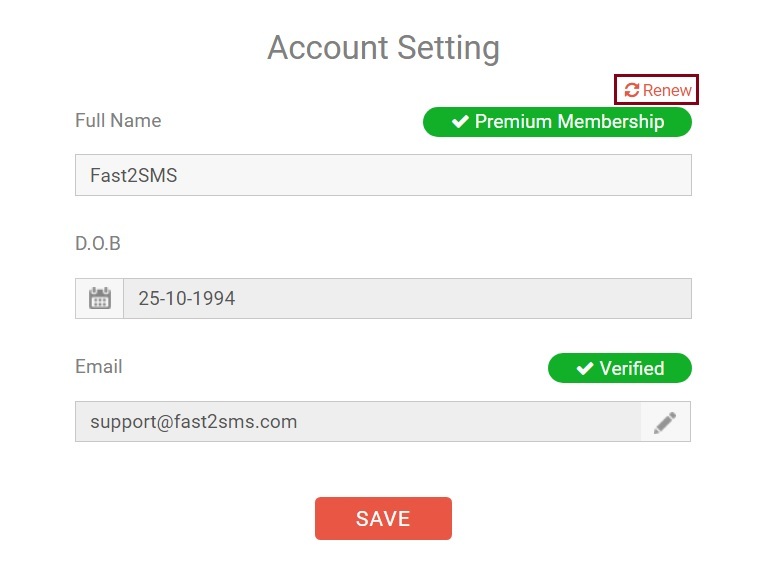 All your billing details will be saved in your Fast2SMS account. The third tab is Change Password. 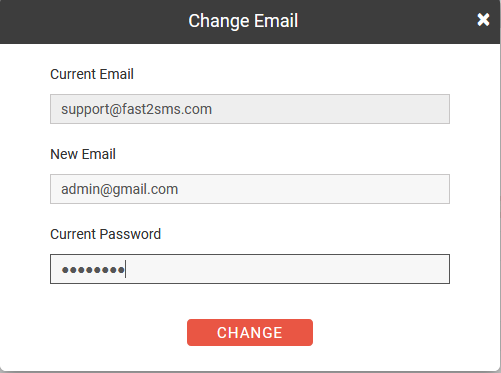 If you want to change your password in Fast2SMS, then enter your Current Password, then enter your New Password and confirm it by entering again. After that click on the Change button. As you click on Change, a message appears in the right side of the screen that Password has been changed. This is the way how password is changed. Click on Change Mobile No. option. Enter your current mobile number. Then enter the new mobile number and your password. After that click on Change button. An OTP will be sent to your new number by Fast2SMS. The message will appear as follows. Enter the OTP received on your mobile. And then click on verify. Once it gets verified, the number will be changed. Now you can login with your new number and start sending SMS. Click on Disable Account option. When it is selected your mobile number will be displayed. Now click on the ‘click here for disable account’ button. 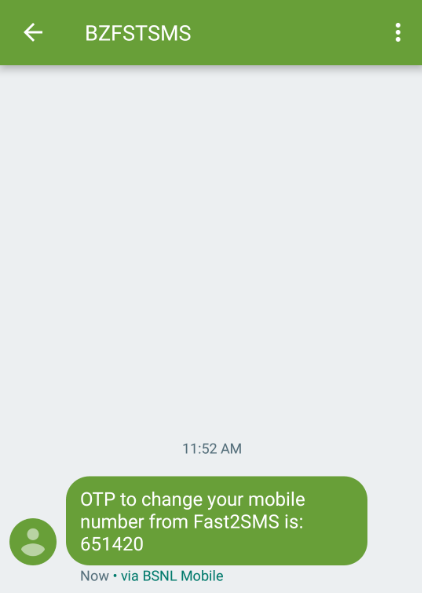 An OTP will be sent to your registered mobile number. Enter that OTP and click on verify OTP. Once your OTP gets verified, you will get logout from Fast2SMS. Note : Once you disable your account your data will get freezed and you will not be able to recover your numbers or SMS. So please be careful while disabling your account. You cannot use your account or login again if you have disabled your account.